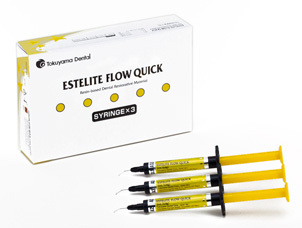 ESTELITE® FLOW QUICK is a low viscosity (Medium Flow), light cured, radiopaque, submicron filled resin composite. 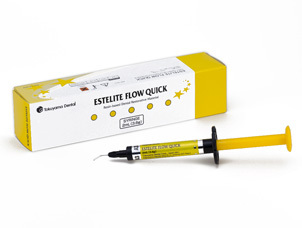 ESTELITE® FLOW QUICK is designed for use with both anterior and posterior restorations. ESTELITE® FLOW QUICK adopts patented Radical Amplified Photopolymerization initiator technology (RAP technology) so curing time is diminished by 1/3. ESTELITE® FLOW QUICK also offers outstanding esthetics, an even lower shrinkage rate, longer working time, and higher mechanical strengths as well as more shade variations. ESTELITE® FLOW QUICK contains 71% by weight (53% by volume) of silicazirconia filler and silica-titania filler. 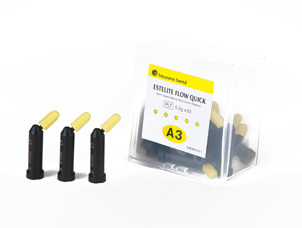 Every inorganic filler contained in ESTELITE® FLOW QUICK is a spherical submicron filler (mean particle size: 0.3μm, particle size range: 0.04 to 0.6μm) that enables excellent gloss retention and wear resistance. 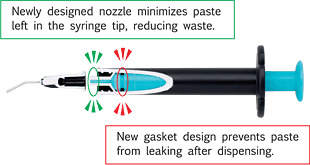 Tokuyama has redesigned the syringe for easier dispensing with minimal waste. Wider shade matching range /"Chameleon effect"